Peterborough United owner Darragh McAnthony has revealed there have been “multiple enquiries” about on-loan Nottingham Forest striker Jason Cummings. The ex-Hibs forward swapped the City Ground for the London Road Stadium on a season-long loan at the beginning of the 2018/19 campaign but despite eight goals and five assists in 29 games for the Posh, Cummings has struggled for game-time in recent weeks. The 23-year-old didn’t make the matchday squad for Peterborough’s 2-1 win over Rochdale at the weekend, with recent signing Lee Tomlin grabbing the opener. Cummings hasn’t played the full 90 minutes of a match since September 1, and has only managed appearances of more than 20 minutes off the bench twice in Posh’s last 12 league matches. 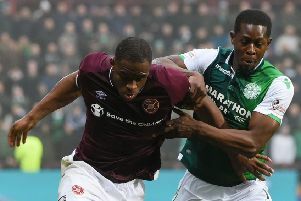 Hibs boss Neil Lennon was last week asked about the possibility of bringing the striker back to the Capital, and appeared not to rule out a move, saying: “Jason is someone we know very well”. However, Cummings is bound to have numerous suitors given his exploits north of the Border and his early form for Peterborough. Forest are also expected to confirm the arrival of former Celtic and Republic of Ireland boss Martin O’Neill to succeed Aitor Karanka, who left the City Ground last week.